Hearts- Last year I ‘heart attacked’ my husband’s car. This time last year, My Mr Right was working nights, so attacked his car during the day while he was asleep. It was way cold though. BRRR! But he loved it when he went out and saw it. He came back in and gave me another kiss. I’d call it a success! Hahaha- Find a comedy you haven’t seen yet or his favorite comedy and watch it together. Laughter is the best medicine, after all. I promise, if you take the time to laugh with your sweetheart, you will be closer and your relationship will be so much better. His & Hers- There are tons of possibilities for this one. You can take just about any item and personalize it. I found a blanket at Target for $5 and embroidered our initials into it. You can find mugs, glasses, and even plates at the Dollar Tree and make a monogrammed set of dishes for your sweetie with glass etching. Pillowcases are easy to personalize with fabric paint and freezer paper. 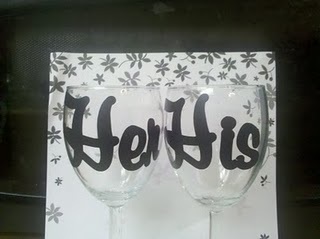 Or personalize some goblets..
Hawaii- Plan a date night with a tropical theme. Have Hawaiian Haystacks for dinner, play tropical music, watch a movie with a tropical setting, give your sweetie a treat and perform a hula dance. Get creative! Hidden, Hints, Hunt- Take your sweetie on a treasure hunt! Honeymoon- Recreate your honeymoon as closely as you can. Pull out the photo albums and remember the real thing. Hotel- Splurge on a night away together, even if you never leave town. Husband- Plan a night with your husband as the theme. Serve his fave dinner, dessert and beverage. Let him have the remote and don’t complain. Give him a back rub or foot rub. Indulge him.